Why are these trees made of uranium? 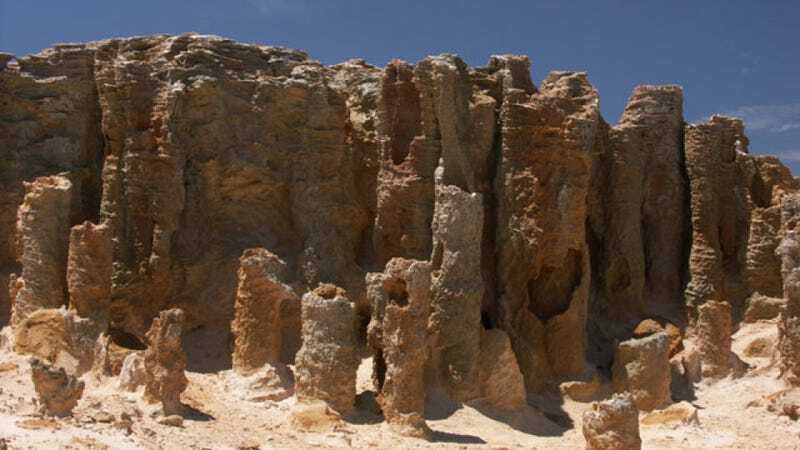 Buried in the deserts of the world are fossils of trees and animals that died millions of years ago. Those fossils are often made of packed sediment. Occasionally, that sediment is uranium. Fossil hunters can find their quarries a number of ways. They can go where other finds have been discovered, and dig deeper. They can study where oceans or lakes used to cover the landscape and take their chances there. Or they can wave around a Geiger counter. A lot of old fossils are filled to the brim with uranium that has a high percentage of U-235. How does a fossil made of bone get get turned into a fossil made of uranium? It's actually part of the same process that turns it into a fossil in the first place. Organic material gets buried in sediment, but it doesn't get dried or preserved. Instead the organic material is eaten away and replaced by minerals that crystalize along the tiny pores that form in the organic material. Uranium combines with oxygen to form uranium oxides, and these dissolve in water. They flow wherever water flows, including through sediment. The water wore away at the porous organic material. The uranium oxides precipitated uranium so it lined the pores, replacing the bone or bark with rock. What was left was a fossil made of large amounts of uranium. In the past, before big companies sold uranium, people combed through the desert looking for these fossils so they could sell them to the government. Paleontologists still do use Geiger counters to inspect sites, and museum curators use them to inspect their exhibits. Sometimes museums have separate halls for their more radioactive fossils. Even small fossils owned by collectors are often filled with uranium ore. Generally, it couldn't do any real damage to them, provided they keep it away from sensitive areas. So let that be a lesson to us all - no keeping fossils in our hats or our underwear.